Here is a fun food from Food As Medicine by Dharma Singh Khalsa, who states that "tofu and sesame seeds are high in calcium and protein." I've made some personal modifications to the recipe which I find makes it very tasty (pictured here using spinach and carrots). Use as dip, too! Steam tofu for 10 minutes. Squeeze out any remaining water again, then crumble tofu and mash with a fork. Blend in celery, scallion, parsley, and red pepper or carrots. In a separate bowl, blend together the lemon juice, mayonnaise, olive oil, yeast flakes or parmesan, garlic, salts/seasonings, and tahini. Combine with tofu mixture. 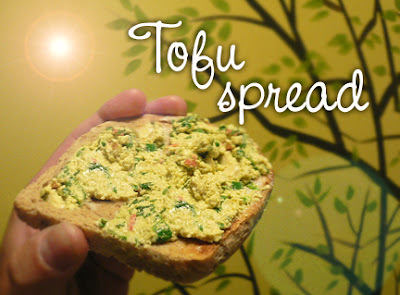 Serve with rice crackers and sliced vegetables, or as a sandwich spread. Makes about 2 cups.